Large picture: one hand on the handle bar, it's that easy to win the three hour race. Werner de Hamer racing to be first on his M5 Low Racer. Once again good results for the M5 racing team on the international event Cycle Vision. Note the difference between the number one and two of the one hour race. Bram Moens (1956) versus Edwin van Vugt (1981) with app. 10 km difference in just one hour! Edwin used the fairing of the world record holder from the German Speedbike Team, but nevertheless did not succeed in beating Bram Moens. The M5 team never got the chance until now to make a record attempt on the same recordtrack of Opel which is used by the German Speedbike Team. This result shows clearly the potential of this M5 fairing versus the current "recordholder". The M5 Team managed to conquer three 1st places during the Cycle Vision event, two 2nd places, three 3rd places, two 4th places and one 5th place. All riders unfaired (only tail fairing). David van der Laan didn't even have a tail fairing on his Shock Proof. Bram only used full fairing during the one hour race, he did the quarter mile unfaired. 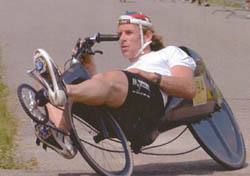 * Allert Jacobs and John Poot one place before Werner on their tandem. ** David van der Laan was first in the junior class of the criterium. Before him were two participants, who were 16 years old, which is too old for the junior class.